How to install and use Piezography ink on the 4000. Use these procedures to convert your color printer to a Piezography printer. If you are installing a Continuous Ink System (CIS), please refer to the installation instructions provided with the CIS. If you are installing user refillable cartridges, please refer to the installation instructions provided with the refillable cartridges. If you lost your refillable cartridge instructions, please go to our main support page to view the cartridge instructions. Whether you use refillable cartridges, CIS, or pre-filled cartridges (available outside the USA), the placement of the shades of Piezography ink are critical and not arbitrary. You must refer to the shade placement chart provided here on this document. Most Piezography systems depend upon the QuadtoneRIP software with which to control the ink shades. Installation instructions and support of that software is provided by the manufacturers of those software. We provide our own guides to our suggested use of QuadToneRIP, so that you can get the best results from that product. Additionally, Piezography on the Mac requires the use of Print-Tool. This software has quickly become a defacto utility for anyone wanting to properly color manage their printing workflow. A full manual for Piezography can be downloaded with the free Piezography Community Edition. Verify that your printer functions perfectly with Epson inks before installing Piezography inks. In addition to printing a perfect nozzle check, make certain that the printer does not have unfixable banding problems by making test prints. Take the time to scrutinize your printer’s performance before the next step. It is not possible to diagnose many printing problems on a printer that has not first been tested with Epson inks. Ideally you should also align your print-head for UniDirectional printing before switching to Piezography inks. If you are having problems with your printer or print-head, please look at our detailed instructions on how to clean your print head. The use of flush cartridges is suggested when switching to Piezography inks from a non-Epson or non-Piezography ink set, or if you have been experiencing clogging problems with your current ink set. Otherwise, the actual Piezography inks can be used to "flush" out the pre-existing color inks from your printer. If you do not use flush carts, you may need to print some additional media before all traces of color ink have been removed. The K7 ink set consists of seven cartridges, and this is an eight cartridge printer. Use a non-empty photo black flush position cart, or Epson photo black ink cartridge in the eighth, photo black slot. Don’t use a chip resetter on an empty Photo Black cartridge to “fool” the printer into thinking it has ink in the Photo Black position—using an empty cartridge will damage the print head! A set of ink cartridges; a set of flush cartridges (if used); an eighth cartridge, either ink or flush fluid for the Photo Black slot; a spare maintenance tank (available through Epson), or a large format cartridge and waste tank chip resetter. Note about the maintenance tank: Instead of replacing a full maintenance tank, you may use a large format chip resetter to reset your maintenance tank chip to read empty. It is safe to reset the maintenance tank chip one time; if you wish to do it more than once, periodically check the waste ink level in the tank, to ensure that it does not overfill with waste ink. It is possible to dis-assemble the maintenance tank and replace the filling with some absorbent material. Chip resetters are available on-line. Be sure to purchase one specifically for large format Epson printers. Test the printer with Epson inks, and have the necessary equipment on hand. Turn off the printer, raise the ink levers, and remove the cartridges from the printer. 3. Install the flush or ink cartridges in the printer, and lower the ink levers. 4. Hold down the Left Arrow, Down Arrow, and Up Arrow buttons simultaneously as you turn on the printer. This activates the Service Menu. The ink change procedure for this printer is performed using an INITIAL FILL procedure. This option is found in the SELF TESTING > CLEANING menu. Follow the prompts on the LCD screen, and hit the execute button to begin the initial fill. After the initial fill cycle finishes, restart the printer. If you have just installed ink, print a nozzle check pattern. If the ink channels are still stained with the original color inks, run a KK2 cleaning cycle to clear out the old inks. The KK2 cleaning option is found in the SELF TESTING > CLEANING menu. After the KK2 cleaning, print another nozzle check pattern. You should find that the color stains are gone and the printer is ready for Piezography printing. If you have just installed the flush cartridges, turn off the printer, allow it to sit overnight or longer (longer periods of time are not harmful to the printer), and then repeat the above steps to put the ink set in the printer. Allowing the printer to remain filled with flush fluid will help remove residue from the previous ink set. Important Note: Do not rely on the "automatic" nozzle check cycle when running Piezography inks. The printer does not recognize the ink densities of the patterns and will determine the print head is clogged, even if it is not. Use the "manual" nozzle check cycle instead. 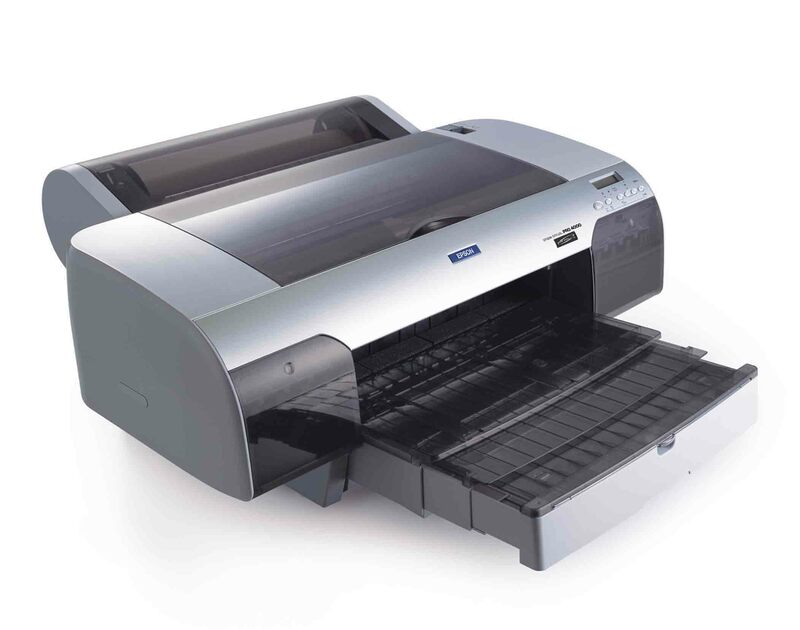 Epson 4000, 4800, 4880 are different generations of the same 17″ printer. The 4000 is old but these are very strong printers and often available as refurbed in the Epson clearance center for only $595. These printers can all be configured as glossy compatibles because they have 8 ink cartridge positions. We wish their paper handling was better. They can sometimes be a bit frustrating when thicker paper is loaded in the tray. But, they are built well. The other benefit of these printers is that they are desk mounted rather than stand mounted. You can easily stack several on a rolling restaurant style wire rack system, and run a small print shop in a compact space. We run three printers on one rolling rack. We even have room on the top shelf for our 17x22 paper boxes. You may wish to remove and save one or more cartridges that you have removed from your printer, for use in the future. If you want to store your cartridges for later use, place the removed cartridges in plastic bags, close the bags tightly to minimize ink evaporation, and place the cartridges in a box so that they sit upright, as they do when they are in the printer. Storing a previously opened cartridge on its side or upside down will allow ink to leak out of the air vent holes. We recommend taping over the vent holes to prevent evaporation. Many of our ink cartridge (large and small) come with vent-hole plugs. Make sure to place these vent-hole plugs back into the cartridge before storage. Make sure to remember to remove them when you want to use the cartridge again though! Note: On small format cartridges, it is very important that you do not allow ink to touch the air inlet filter. Make sure your cartridges remain upright at all times. Getting started with Piezography printing and QuadtoneRIP. Now that you have your inks installed, you must print your images through QuadToneRIP shareware software. It is not possible to achieve good results without using QuadToneRIP. Go here to download and install QuadtoneRIP for Mac or PC. We provide a comprehensive user manual for Piezography along with a set of pre-made curves "profiles" for use with QuadtoneRIP and various fine-art inkjet papers. After installing QuadtoneRIP make sure to ask download and install our free Community Edition set of curves and documentation. This will guide you through the process of installing your Piezograhy printer on both Windows and Mac operating systems so you can print. We support an ever evolving list of fine art inkjet papers. You can see the list of officially supported papers here. Please note that this list is new as of 2016 and we have not yet updated every curve for every inkset and every printer and every paper (over 1500 different curves). This will take some time. Many curves work perfectly for a vast amount of differently branded papers. The Hahnemuhle Photo Rag curve (for example) will work just fine on Moab Entrada Rag. If you do not see your paper listed in the pre-made set of curves available from the Piezography Community Edition download, experiment by using a curve made for a similar paper. We provide free technical support at our forum at http://inkjetmall.com/tech. We also provide direct paid phone support at inkjetmall. Before requesting support please register on our forum and also look through all of the support documents on our Piezography Knowledge Base web page. You may find it very helpful to view our F.A.Q. section for Piezography. This will tell you a lot! Do you have a question or comment regarding these instructions? Please contact us directly.